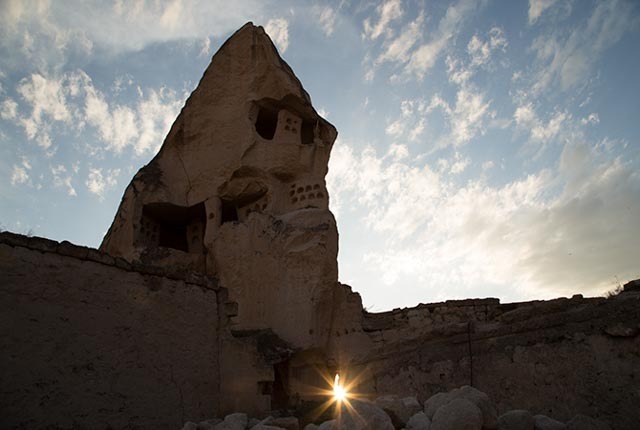 I came to Turkey, in no small part, because of Cappadocia. Images of this place have fascinated me for years. Here fairy tale castles seem to melt out of massive mountains and march toward the open plain. Like the Badlands of South Dakota, an erosional process first forms valleys, then, because some of the rock is harder than the rest it resists erosion and columns form. The columns look like mushrooms to some, like something more phallic to others. This is geology that readily offers itself to artistic interpretation. The natural processes that formed the fairy castles took millennia, but what happened in the past thousand years is equally fascinating. People found that they could carve cave homes into the soft tuff that makes up the castles and they got busy burrowing. In some places there are underground cities seven stories deep. Early Christians were some of the first to dig, hiding themselves and their churches in the rock because their beliefs were a crime. More recently, going back only a few generations, regular farm folk made cave homes, so now in this region the remains of troglodyte villages abound. Today Cappidocia is a thriving tourist destination…and one of the busiest hot air ballooning places in the world. During the day we hiked the valleys and explored the caves, and then on one special day, very early in the morning, we got into a hot air balloon and rose into the dawn over the lunar landscape for one of the most memorable experiences of our lives. We were not the only ones. No less than 60 balloons rise on a typical morning. Each balloon carries around 20 passengers so there are hundreds of gleeful souls floating in the morning mist bobbing in and out of valleys and soaring high in the sky. After an hour or two the pilot puts down gently in a wheat field, ours expertly dropped his craft right into the transport trailer. Champagne for all at the end of a great flight! For tips on photographing the balloons click here. It’s good to hear from you. Cappadocia is really a great place for photography and the people are fantastic. There is nothing like floating over the landscape in a hot air balloon at daybreak.